A blog to follow the journey of the Recovery Panes Healing Arts Project in Portland, Oregon. A project to help those whose lives have been impacted by addiction through the cathartic medium of encaustic (wax & fire) painting. All individual paintings are joined to form a larger work, framed and presented to resemble large windows with each painting representing a single windowpane. 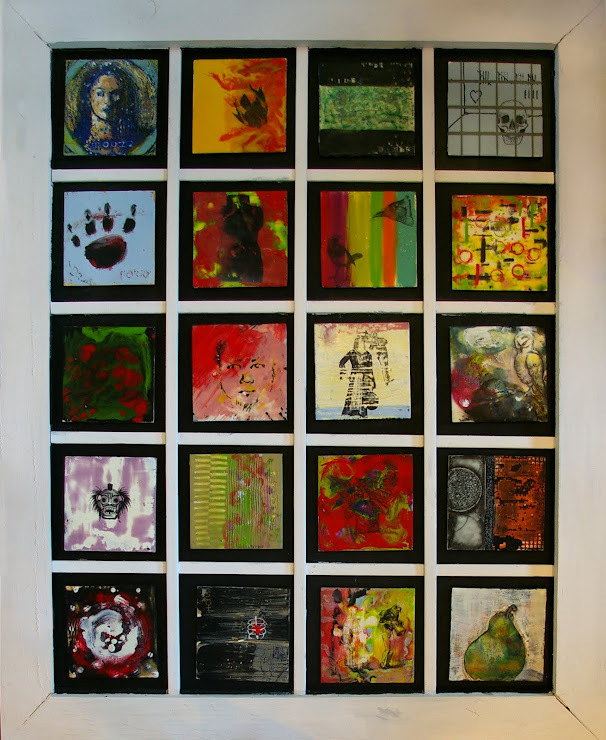 The art is interactive- the individual panels are mounted on magnets, allowing the viewers to rearrange the paintings, symbolizing our need to change our perspective and move towards de-stigmatizing addiction. Both the Recovery Panes and the accompanying catalogue will be shown at the Portland Center for the Performing Arts through March of 2012. Time to dust off the Project? Recovery Panes has shown all over town in some pretty visible venues in the last few years, including Portland City Hall, Portland Center for the Performing Arts and Portland City Club to name a few. Having gone through a major move in the last year, it has been packed up and stored in a very generous friends barn for the last 6 months.. Thanks Kym!! Today I applied to have it installed in the Portland Building and am looking to possible find a more permanent place for it to be viewed and interacted with.. Possibly a hospital or something of the sort. Keep your eyes out and let me know if you know of a great home for the Recovery Panes Healing Project to help even more people!! Getting all the details together for the big show at the Portland Center for the Performing Arts. (PCPA). I am curating an encaustic showcase called 'Come to Your Senses' that will hang in the lobby of PCPA and Recovery Panes will be on the second floor. A great opportunity to see encaustic paintings being approached from a multitude of experiences and expertise. The presentation at the International Encaustic Association Retreat was well received. 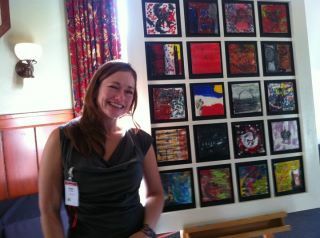 Many were moved and approached me about how to incorporate a Recovery Panes style project in their community. All 9 windows were on display and many non-conference people were able to participate in the interactive installation part of the project. One guy was so moved he thanked me profusely while he teared up holding the book with all the stories. This makes my heart warm. International Encaustic Retreat will feature Recovery Panes Project!! I will be installing the project at Edgefield here in the Portland area for the International Encaustics Retreat. They have asked me to present on how to use art as a way to contribute to the community and on how art can be used as a healing method. Well, Recovery Panes is BOTH of those things. Two very near and dear things to me. It's a little far-off, but mark your calendars--Recovery Panes will be showing once again, this time at the symphony level of the Portland Center for the Performing Arts, from January 5th, 2012 - April 2nd, 2012 as part of an encaustics showcase. City Club of Portland hosts! Recovery Panes at City Hall! 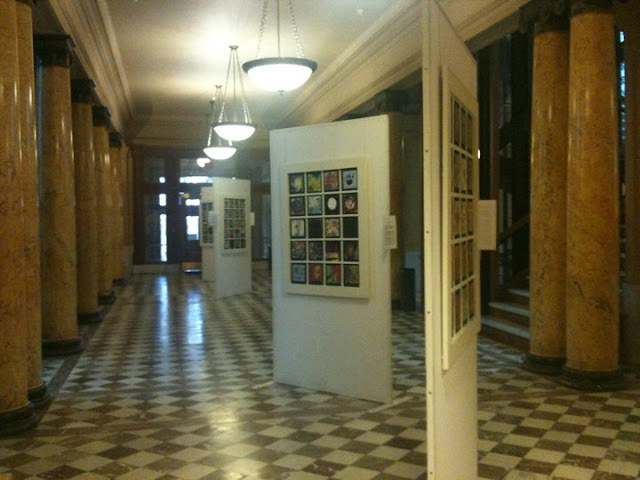 As of yesterday, Recovery Panes is up and showing for the next month on the 2nd floor of City Hall! Kelly gave testimony this morning at the State of the Arts address, explaining how organizations like RACC make these kinds of creative healing projects possible, and how important these projects truly are. Once again, we'd all like to thank RACC and City Council for all the incredible support we've been given throughout this process! Be sure to stop by City Hall and see the installation sometime this month--new catalogs have been printed and they're gorgeous!